New Audi A4 revealed | What Car? This is Audis new A4 its answer to the all-new BMW 3 Series. The A4 has a new look, chassis improvements and a range of more efficient engines and it goes on sale early next year. 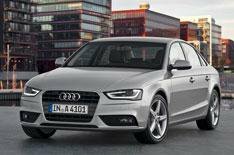 The A4s cosmetic changes bring it into line with Audis latest models. At the front theres a new bonnet, grille, bumper and headlights, which echo the design of the latest A6. Similar changes were made to the closely related A5 Coupe, Cabriolet and Sportback earlier this year. Audis latest front grille with angled upper edges is central to the new look, while the new headlights are smaller and have a 'wave' along their lower edge. As before, there are bespoke bumper designs for standard, S line and Allroad models. There are less dramatic changes at the rear, but there are new light lenses and the bumper has been reshaped. Inside, there are new steering wheel designs, which include chrome and highgloss inlays. The MMI control system has been updated, with fewer buttons and simplified controls, designed to make it more intuitive. The UK engine line-up has yet to be confirmed, but Audi says fuel consumption has dropped by 11% on average, so therell be a similar reduction in CO2 emissions. All versions now have a stop-start system as standard. Most 2.0-litre diesel versions come with a new flywheel thats designed to make the engine smoother at low revs, to encourage earlier upshifts and therefore improve fuel economy. The most efficient diesel version is the 2.0 TDI 136, which has CO2 emissions of just 112g/km down from 120g/km. The 1.8 TFSI petrol unit is all-new, and emits 19% less CO2 than its predecessor. Tweaks to the rear suspension are designed to improve the A4s ride and handling. Theres a new electromechanical steering system, too, which helps to reduce CO2 output by up to 7g/km.? Additional standard safety kit includes a system that detects when the driver is getting tired and issues a warning. There are a range of new infotainment systems, including an updated MMI navigation plus option, with a hard-drive, colour monitor, 3D graphics and DVD player. Audis Bluetooth online car phone is another new option; it includes a Google search function, Google Earth sat-nav images and a Wi-Fi hotspot. The revised A4 range goes on sale in early 2012. Audi hasnt confirmed prices, but small increases over the current car are likely. More details are expected soon.